Heroes, Heroines, and History: Say Cabbage and Smile! In 1850, Julia Shannon of San Francisco took the family portrait to new heights when she shockingly advertised herself as a daguerreotypist and midwife. After reading about her I just had to write about a lady photographer. 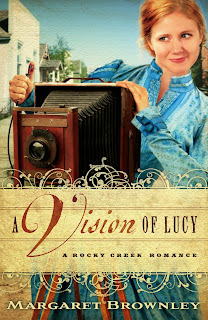 Of course, the heroine of my book A Vision of Lucy doesn’t deliver babies but she still finds plenty of ways to get into trouble. 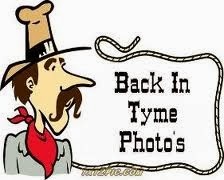 I loved writing about old time photography and have nothing but awe for the brave souls who first took camera in hand. Not only did they contend with unwieldy equipment but also dangerous chemicals and exploding labs. Women had an advantage over male photographers who were often confounded by female dress. This explains why one photographer advertised in 1861 for an assistant, “Who understands the hairdressing business.” Women also had a few tricks up their leg of mutton sleeves—or rather their skirts. Elizabeth Withington invented a “dark thick dress skirt” to use as a developing tent when she traveled. Those cheerless faces in early photographs were partly due to vices that held heads still for long periods of time. Photographers used all sorts of devices to hold a client’s interest. One even had a trained monkey. Another photographer had a canary that sang on command. Mechanical birds were a favorite gimmick and “Watch the birdie” became a familiar refrain in studios across the country. Magazines and newspaper ran ample advice for posing. An 1877 edition of The Chicago Inter-Ocean advised women with large mouths to say the word “Flip,” although one photographer preferred the word “Prunes.” If a small mouth was the problem the word “Cabbage” would make it appear larger. Not everyone was enamored with cameras. One dog owner put up a sign warning “photographers and other tramps to stay away” after his dog had an unfortunate run-in with a tripod. Did photography have a bearing on the suffragette movement? Indeed, it did, but it appeared to be more of a detriment than a help. The photographs of militant suffragettes and women dressed in bloomers did more harm than good. If you think America was tough on suffragettes, think again. The women’s rights movement was considered the biggest threat to the British Empire. According to the National Archives the votes-for-women movement became the first "terrorist" organization subjected to secret surveillance photography in the world. Photography has come a long way since those early daguerreotype days. One can only imagine what the brave souls of yesteryear would think of today’s “aim and click” cameras. Now days you can’t even drive down the street without having your picture taken. But as the heroine of A Vision of Lucy would say, it's best not leave the house unless you’re ready for your close up. Having your photograph taken used to be a special occasion. Today, no one thinks twice about snapping pictures. Do you think we value photos less or more today than we did a century ago? 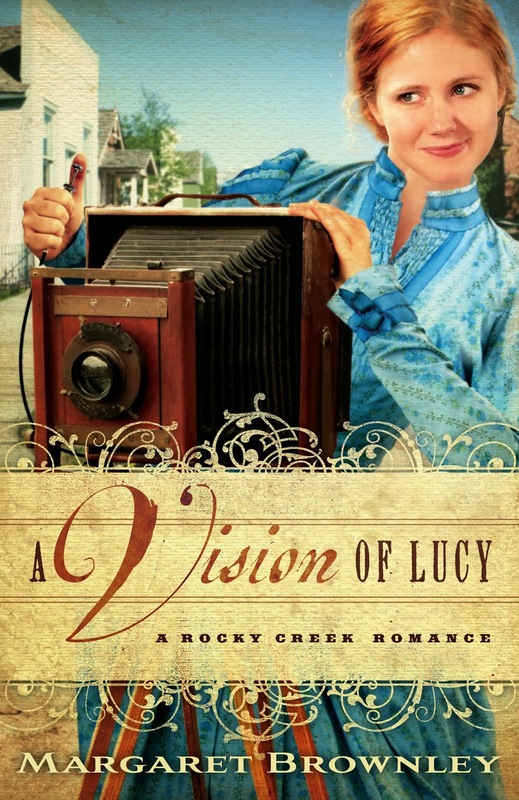 When posing for Lucy anything can happen--and usually does. and is a New York Times Bestselling Author. My great grandfather was a photographer in the late 19th Century and I have several photos he took of people. I have always been fascinated with his choice of profession because he is part of a long line of ancestors who showed a creative bent, right down to me, an author. I never thought about how photography was then considered to be a man's profession. A far cry from today when "selfies" are being taken all the time and some of our best professional photographers are women..
Hi Pamela, what a great treasure your great grandfather left you. 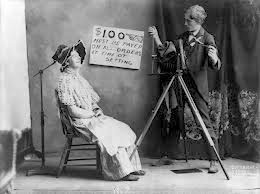 Actually, it's not surprising that women photographers were frowned upon back in the 1800s. Not only were women expected to marry and have children, photography was downright dangerous--all those chemicals. Today it's meth labs blowing up. Back then it was darkrooms. Thank you for sharing. Margaret, thanks for your enlightening post about photography. I always wondered why people in the pictures had such dour expressions. We are fortunate to have a photo of my grandparents on their wedding day in 1907, which my brother had restored. Recently I came into possession of two photographs of my grandmother taken aournd 1905-6. It's fascinating to look at the clothes of the era and wonder what life was like for her at that time. Marilyn, I love old photographs and treasure the few that I have. It's fun to look back and imagine what life was like back in the olden days. Hi Jackie, thank you for stopping by. The terrorist bit is kind of funny when you think about it. Can't you just imagine Scotland Yard spying on those women? Have a great weekend! So interesting about photography and fiction writing. 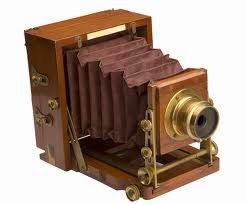 I like the look of the old cameras.